Teams look for items that begin with each letter of the alphabet at the Mall. Can be played from an alphabetical list (see our list below), or teams can be assigned a few letters per team. This game can be played with a digital camera, but if your mall won't allow pictures to be taken inside the mall it can be modified to be a cheap scavenger hunt. Hunt for presents and prizes for the birthday party, or give each team $10.00 and have them purchase as many items as they can with it. Make sure to get receipts so the stores and amounts can be verified. Free for non-commercial use - if posting on the web please use a link back. Thank you! Find more Mall Scavenger Hunt ideas all with free item lists! Neighborhood Scavenger Hunts, Nature Scavenger Hunts and Charity Scavenger Hunts see our Scavenger Hunt page which includes complete instructions and links to all of the Scavenger Hunt free item lists. 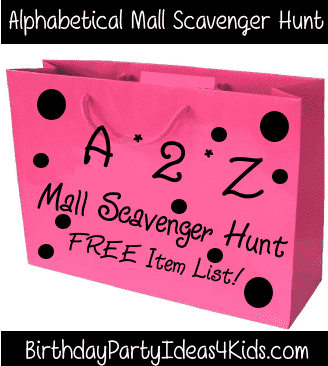 Free Mall Scavenger Hunt List for the A 2 Z Mall Scavenger Hunt. Teams must be courteous to shoppers and mall employees. No two items can be from the same store. All team members must be in the picture. Receipts are required for the $10 hunt. 5 points for picture of each item. -10 point deduction for every instance of running, screaming or being rude to salespeople or shoppers. -1 point deduction for every minute teams are late to the meeting place. C Cowboy Hat, Chocolate Bar, Cards, Credit Appl. More Mall Scavenger Hunts - 8 to choose from!